Collectible Album Release Features Unique Black On Black Jacket — With Clear Cellophane Vinyl. This is sure to be a collectible for punk rock fans everywhere. Artist Biography: Richie Ramone is the fastest, most powerful drummer who ever played with the legendary punk rock band the Ramones. He joined the Ramones in 1983 and first appeared with the band on their Subterranean Jungle tour. In 2007, Richie Ramone introduced his virtuosic drumming to the symphonic world with his “Suite for Drums and Orchestra” based on Leonard Bernstein's West Side Story. He debuted his arrangement with the Pasadena Pops Orchestra as the featured drum soloist and was an immediate hit with critics and patrons there and in other cities. He is currently working on another innovative “Suite for Drums and Orchestra” comprised of classic James Bond movie songs. In 2011, the Recording Academy gave the Ramones a Grammy Lifetime Achievement Award in Los Angeles, where all three of the band's drummers (Tommy, Marky and Richie Ramone) stood beneath the same roof for the first time ever. 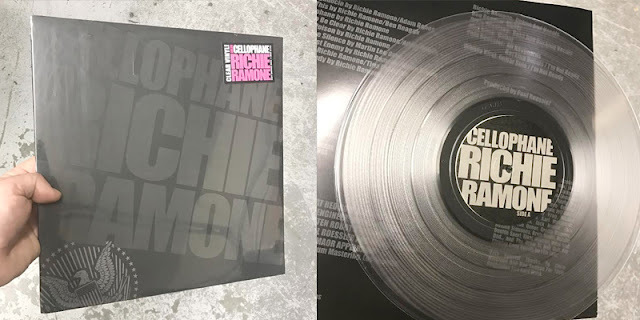 In 2012, Richie was the only surviving Ramone featured on the second Joey Ramone solo album, “Ya Know?” On October 8, 2013, Richie released his first solo album, "Entitled," which features new songs written by Richie as well as new recordings of songs he wrote for the Ramones. Billboard notes, "Richie's 12 freshest cuts aim to please fans of both rock and metal with its blend of power chord-chugging simplicity and guitar hero virtuosity." About The Video: Shot @ Red Bull Studios LA. And in and around Highland Park CA.